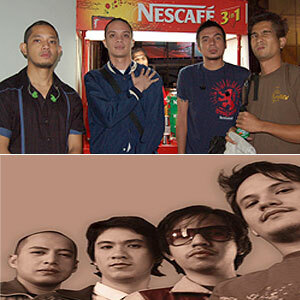 The bands Bamboo (top) and Pupil (bottom) were some of the band-mentors for the 13 college bands that joined the Nescafe Soundskool 2008. Naging matagumpay ang nakaraang Nescafe Soundskool 2008 lastNovember 15 sa Ultra, Pasig City kung saan naglaban-laban ang 13 new bands withtheir own compositions. Mayroongstudent-mentor theme ang naturang paligsahan kung saan ang mga baguhang bandaay tinuruan ng mga sikat at hinahanggang banda ngayon. Ilan sa mganag-participate at nagsilbing mentors sa mga baguhang bands ay ang Bamboo,Sugarfree, Callalily, Monster 88, Cueshe, Up Dharma Down, UP Kilat, Pupil,Sandwich, 6Cyclemind, Spongecola, Chicosci, Urbandub, JR Kilat, Itchyworms, atParokya ni Edgar. "The Nescafe Soundskool Finals provides the opportunity of alifetime for young bands as they get to share the stage with their musicidols. It also serves as a uniqueconcert treat for the public as they get to enjoy exciting performances andgreat music form both the present and future of music," says Nescafe marketingand promotions manager, Eileen Rose Bangcoro. Para naman kina Jay of Cueshe at Chito Miranda, leadvocalist ng Parokya ni Edgar, isa itong magandang proyekto na nagbibigayoportunidad sa mga aspiring bands nagustong makapasok sa music industry. "Sobrang saludo kami sa mga tulad nitong coffee company naito na sumusporta sa local music scene, giving chance sa mga bands nanagi-strive and lahat naman kami tulong-tulong na himukin ang mga kabataan namag-banda. Tulad nga ng sinabi nila, goout and form a band. Nakatulong ito para makagawa ng break out ng opportunityfor new bands. Kami never kaming napagod na sumuporta sa kanila for the kidsand for everyone elsen na gustong magbanda," pahayag ni Chito sa PEP(Philippine Entertainment Portal). "Actually this event is very good for every students whowants to be somebody, wanting to go to the music scene and wanting to be a partof the music business kasi, di ba, everybody starts from scratch, at least inthis event, everybody's got the chance na makatugtog with the live audience,with a lot of people, with lots of good bands." All the finalists received P25,000 and slots in the NescafeSoundskool workshop in Boracay whereinthey will also get the chance to learn from the country's music experts. Ang grand winner ng Nescafe Sounskool 2008ay nakatanggap naman ng P250,000 in cash at record label from Sony BMG. Ang mga new bands na sumali mula sa iba iba't-ibang panig ngPilipinas ay ang St. Scholastica's College Grace Note, Jose Rizal University'sProject, South East Asian College's Letter Day Story, University of Santo TomasHooligans, Lyceum Institute of Technology's Maracore, Calayan Education Foundation's Flaurah, WesleyanUniversity-Philippines 7th Skool, Skalivur from Eastern Visayas StateUniversity, University of Cebu's Baronets, STI Tacloban's Sounvile, C-Shifterfrom AMA Davao Campus, Keyk from St. Mary's College, Theacers Stand Togetherfrom Xavier University-Ateneo de Cagayan, at ang South West Asian College'sLetter Day Story ang nakapag-uwi ng premyo mula sa Nescafe. Ang Nescafe Soundskool 2008 ay inendorso ng Commissionon Higher Education (CHED).